First up, massive thanks to the lovely Simone and her friend for giving us their spare $85 tickets and associated wristbands. I'm still not quite sure how it all went down, but I know I probably wouldn't have got in otherwise. 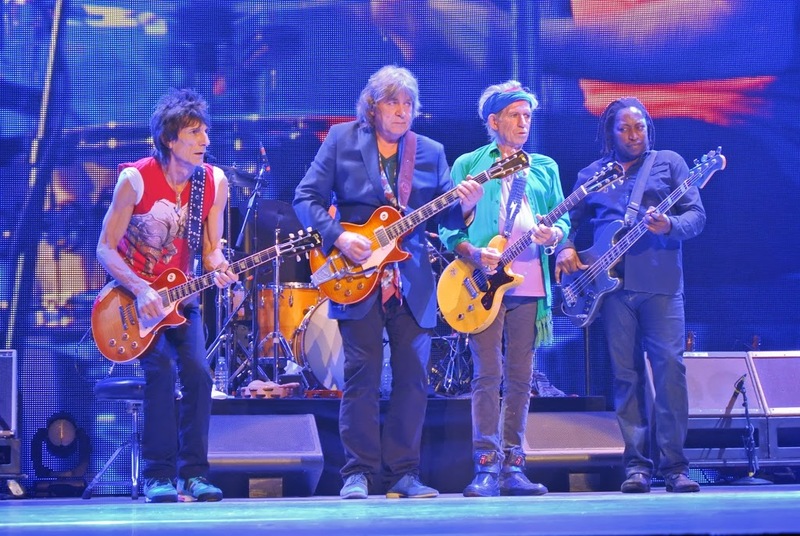 Well, the Stones silenced the multitude of set-list critics and Mick Taylor partisans with an inspiring show that featured "Far Away Eyes," "Sway," and "Can't You Hear Me Knocking," the latter two with Taylor, who also did his usual duties on "Midnight Rambler" and "Satisfaction." I guess he was the evening's special guest. I did hear talk of an unidentified horn player who was lined up for a guest role, but it evidently fell through. Mick also hinted at more California shows when he noted that this Staples Center stop would be the last in the state "for now anyway." On the downside, we may be witnessing World War Four between Mick and Keith, who pretty much ignored each other for the entire show, although they did give resigned shrugs after an abortive outro to "One More Shot." I'm also told Keith tried unsuccessfully to get Mick's attention while they and Ronnie were out on the edge of the tongue during "Sympathy for the Devil," but I did not notice that myself. More frequent were the various little snubs and slights, such as at the ending of "Far Away Eyes," when Keith and Ronnie congratulated each other on a job well done while Mick defiantly walked past them, refusing to join in the glad tidings. They rarely occupied the stage together, with Mick spending an awful lot of time out on the tongue ramp. Keith was also more ambulatory and seemed to have a better night, which is not saying much. So I wonder if he bested Mick in an argument, and Mick was grumpy about it. Mick only had eyes for Chuck the band leader, communicating to him with a complicated system of hand and facial gestures. Mick really is in total command, an absolute genius. One time he noticed Ronnie waving and nodding to a friend in the pit during "Tumbling Dice" and correctly surmised that the the guitarist had no idea what was going on and was at risk of playing his solo at the wrong time. So Mick waved his hands at him - No! No! No! - to ensure that Ronnie kept his powder dry for another verse. Everyone will probably rave about the new Taylor twofer, "Sway" and "Can't You Hear Me Knocking," which were predictably rusty and loose. I preferred the latter, despite some dodgy solo work in the initial stages by Taylor. Just as he as getting on fire, Jagger seemed to want to end the song, signaling first to Keith (who ignored him) and then clapping fast almost in Taylor's face. But I could be misinterpreting something. Wasn't there supposed to a harp solo in that song? "Sway" was a bit too rough, Keith bulldozing through the mighty opening riff, emasculating the song in the process. I wonder if large swathes of the audience were even familiar with it. My favorite was "Far Away Eyes," in which the action took place "late Saturday evening" instead of "early Sunday morning." I loved how Mick almost turned the song into a freestyle rap with improvised dialogue and a different rhythmic structure. Sure, it's a corny song but we like it. I wish Lisa and Bernard did not have to sing here, as they drowned out Keith's backing vocals. I also noticed some improv in "Satisfaction," where Mick sang the Otis Redding bits, "early in the morning ... late in the evening." I choked a little during "Satisfaction" as I realized this would probably be the last time I see them on this particular outing. Speaking of me, I self-upgraded once again to the best seats in the house, in the loge two rows up from the floor overlooking the pit entrance on Ronnie's side (section 113). I strongly recommend the $85 folks look for this area because they first few rows are sparsely populated at best. For example, the equivalent section would be 109 in Toronto, 113 in Chicago and 14 in Boston. Just rush down when the lights go down at the conclusion of the fan video. During the boring bits, I contented myself looking at the pit's coming and goings. Mick Taylor was there for the first two songs. Slash arrived in time for "Can't You Hear Me Knocking" and split at the start of "Satisfaction." His wife took a photo of me because I was wearing a pristine Guns/Metallica tour t-shirt from 1992. She yelled to me, "That's where we met." Very strange. I still feel Anaheim #2 was the best show so far, but Staples #2 was a historic night, no doubt. Really enjoyed beginning of the show, and hearing Faraway Eyes first time this tour, but little did I realize what was to come. Saw MT standing behind Charlie's drum kit and thought this was interesting to see him this early. Then he comes out and MJ says they are now going to do Sway with Mick Taylor. Say what?!? Best rendition I have heard (heard it a few times last tour)...MT crushed the solo. Then...during One More Shot, I look behind Charlie's kit and see MT standing there again, guitar in hand. Really had no idea what was coming up now. Comes on stage and we hear the first notes of CYHMK. Unbelievable...great version and a super reception by the crowd. In summary, simply incredible show...awesome set list...band was fantastic! I would say among the best of the twenty-odd shows I have seen since 1981...right up there with the 2006 Forum show during ABB tour...and certainly best of the 4 shows I've seen this month (both Staples shows, Las Vegas and Anaheim last Saturday night). Looks like the Stones are hitting their stride as they leave CA. Hope those that get to see them in their remaining shows enjoy them as much as I have as they continue the tour. Awesome!!!! If this is going to be my last concert from them boys, it's an awesome farewell. High points: mainly the whole show, but then, Can't You Hear me Knocking, and, Midnight Rambler - never (I'm sorry) a true special for me (but not tonight)- what a special moment, 12' or so of the best rock'n'rollband in the world, and Mick Jagger - I know this sounds like a clich� - but who could ever tell he's going to turn 70 next July. Many surprises apart from Can't You Hear Me Knocking, there was Faraway Eyes, Sway, and specialy the fact that the band looked and sounded in top form, what after 6 years, and time doesn't wait for noone, was a complete surprise for me. I finish as I began. If this was my last time with the boys, that's ok, but after what I saw & heard tonight, I wouldn't be completely susprised if somehow somewhere, I'd see these boys in a couple of years time. Worth travelling from Portugal, all 'e way to see 'em boys. Keep rolling! What a night. I have never seen the more focused. There were mistakes, missed cues and such BUT that is the Rolling Stones. With the Stones it is all about the MOMENT. There were a bunch of moments. Like Bernard and Lisa doing the Samba on Sympathy for the Devil, like Charlie being the Wembley Whammer, I had a perfect view of him, the Jag's harmonica playing, Keef's rejuvenation, MICK T. on four songs, the energy from all of them. Last night they played like they had something to prove. The two shows in Anaheim were great BUT last night's show went an extra mile. if you like Rock and Roll and the Rusted Wreck are coming to your or nearby, get a ticket. This is the first time I have ever written a review on this site. While I am a diehard Stones fan, I am still not a fan of the 20 year era of Chuck Leveall/Daryl Jones/backup singers/too rehearsed versions of their songs. They sound completely different without Bill Wyman. The Stones are best when they are spontaneous and unrehearsed � like a garage band. So, I am just not a fan of the arrangements of some of the songs they played last night � HTW, MY, BS, SMU, SFTD, TD, IORR, ADTL � they sound great, yes, but just too popcorny for a diehard fan. The edge and danger is not there. Bill Wyman is missed dearly. So after 11 previous Stones concerts, I just didn�t need to pay $600 for a 12th time. But, My best friend likes the Stones and has never seen them and asked me to go with him so I gave in and said yes. We got a pair of $400 tickets and had good seats. I knew it would be a great show, that they would sound great and perform with tons of energy, but I get frustrated like I said with how they perform these days compared to what they used to do. But, they still sound great and sound better than anyone else out there � which just shows how good Keith and Charlie are to maintain that without Wyman. I�m not going to sit here and say this was the best show ever, etc�. because it wasn�t, when you compare them to what I listened to yesterday � Fort worth 1978. I�m also not going to say they were better than on the past few tours because the songs are so similarly structured the way they perform now as I stated above that it just comes down to taste and which tour do you like better. What I will say is that they sounded great, incredible energy for a bunch of 70 year old guys - they played like a rock band in their 20�s. It was a great show and you definitely get your money�s worth. Next to the time I saw them at the Wiltern in LA in 2002, I will say this was my favorite show for the very fact that I got to see Mick Taylor not 2 times, not 3 times, but 4 times � and twice on songs they had not performed on this tour � Sway and Can�t you hear me knocking. Taylor was amazing. Those 2 songs along with MR � he rocked it. His solo on CYHMK was incredible! The jam section on MR was fantastic and especially when Mick was playing harmonica against Taylor�s guitar. The beginning of the show was great � Get off my cloud, paint it black both sounded great. IORR was good. Gimme Shelter was amazing. I also enjoyed the new material. Far Away Eyes was a ballsy choice and they performed it well but I wish they did something else. You got the silver was a nice acoustic bluesy version. JJ Flash is my favorite song and always sounds amazing. I know it�s been mentioned before but The Staples Center is an AWEFUL venue for a rock concert. The Acoustics are terrible. The bass and bass drum are almost entirely drowned out. If you don�t know the songs, I can see where you can easily get lost and not know what is going on. I enjoyed the new material but again, because the acoustics are so bad, I can see where people have trouble following the songs. Keith is definitely playing better on this tour than on previous tours. I think the slower groove is helping him and he is doing less "posing". On his SFTD solo, he did pose too much for my liking though. He is still great and is best when he just plays. I am disappointed in Ronnie though. For all the hoopla over his sobriety and playing better, I don�t see it. He plays to the crowd way too much. Mick Taylor just plays guitar. Ronnie spends 25% of the time waving to the crowd. I think someone already mentioned it, but during TD, he almost got lost in the song. When he plays, he is good, but clearly, he gets distracted. Another fun highlight was we sat next to a guy who had seen the Stones 59 times and mentioned the name Dean Goodman. I have never met Dean, but of course as a follower of this site, I knew immediately who he was talking about, and it was pretty funny and quite interesting listening to his stories of old Stones shows. Overall, it was a great show even with the poor acoustics. My friend said he enjoyed it for his first Stones show. And I will just stick to what I said above � they sounded great, great energy, and they play better than anyone else out there which is a tribute of how good they really are, but it�s not what they used to be, it�s not the same without Wyman. I had seats in one of the Luxury Boxes just off center tilted towards Stage Left. It was a nice change from Being in The Pit on 5-15 and right in front of the Lip on Saturday 5/18. Usual start -- Great beginning for the un-initiated- Cloud, IORR, Paint It Black, Gimme Shelter. Then -- First Time - All Down The Line. Great version uptempo and rocking. After that they bring out the pedal steel for Ronnie...Could it be? Yep! Far Away Eyes. Love this song and it is always great to hear Keith Harmonize. Now Mick Taylor comes out and we get Sway! For all the Mick Taylor fans who have been waiting and bitching and moaning about more Taylor Tunes, tonight was your night. A Little rocky but still great. Then the two new ones - Doom & Gloom and One More Shot. These songs are beginning to stick into my subconscious. Then another surprise - Keith rips into Can You Hear Me Knocking and Mick Taylor comes on stage AGAIN. He is just chomping at the bit to take his solo and he settles into it and they make an almost note for note recreation of the end of the song as it is played on Sticky Fingers. This was incredible! Keith time: Silver and Before They Make Me Run. Love them both. Mick Taylor AGAIN for Rambler. And this one cooks. The jam songs in this concert - CYHMK and Rambler really got work outs. Then Miss You, Start, Dice, Sugar and Sympathy. It was nice not to be harassed by an usher while singing Brown Sugar. Welcome back to Los Angeles County! Good playing from Keith on Sympathy. Encores: The usual - YCAGWYW is great with -- AGAIN -- The USC Choir -- Fight On! Then JJF and Mick Taylor back on Satisfaction. Great, great concert. Each one of the 4 shows I have seen has gotten progressively better. They are really cooking now and the Taylor fans are finally getting their money's worth.